WEDNESDAY, Nov. 9, 2016 (HealthDay News) -- Antibodies may keep the HIV virus in check and one day let patients stop taking antiretroviral drugs, two new preliminary trials suggest. Researchers tried to quell HIV in 23 patients with infusions of an anti-HIV antibody known as VRC01. 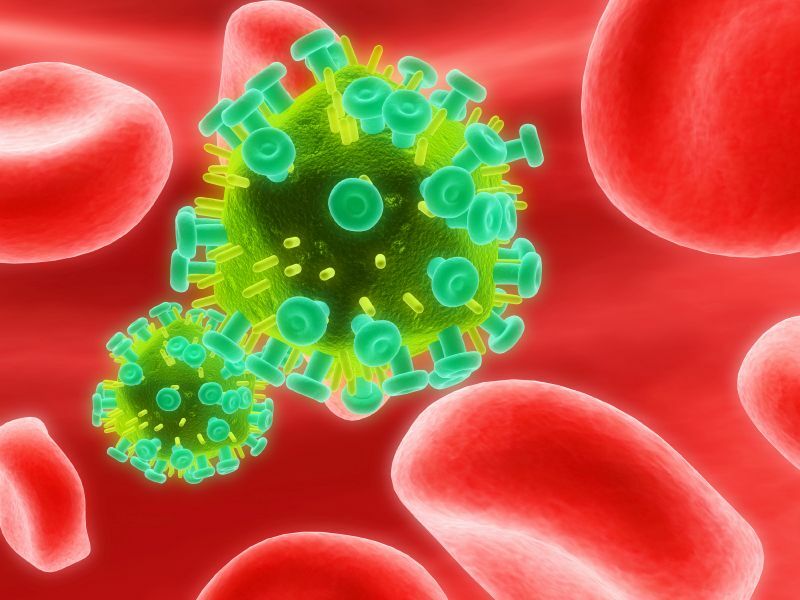 The antibody was safe and repressed blood levels of HIV for a short time before the virus reappeared, the researchers said. HIV is the virus that can lead to AIDS. "We were not expecting that we were going to see a prolonged repression, because it was only a single antibody," said co-study author Dr. Anthony Fauci, director of the U.S. National Institute of Allergy and Infectious Diseases. The next phase is to infuse two or three antibodies intermittently, and see if antiretroviral drugs can be withdrawn permanently, he explained. After regular intravenous infusions of VRC01, participants in the U.S. National Institutes of Health and the AIDS Clinical Trials Group studies saw the virus reappear in the blood, called viral rebound, at an average of 39 and 28 days, respectively, after antiretroviral therapy was stopped. Usually, HIV rebounds within about two weeks after stopping therapy, the researchers noted. These results indicate the antibody may have had a modest effect on temporarily controlling HIV, Fauci said. "It is the very early stage of a new approach to suppressing the virus," he explained. If this approach is successful, the possible benefit to patients is that they could stop taking antiretroviral drugs altogether, Fauci said. "Some patients can't tolerate antiretroviral drugs or they have a virus that doesn't do very well with antiretroviral drugs, and many patients are just tired of taking a drug every day and some would say, 'I'd rather get an infusion every few weeks,' " he said. Fauci said trials using two antibodies should start in the next couple of months. "It's possible that we could get an antibody that hangs around for a long time and you would only have to infuse it every several months," he added. For one study, patients were given infusions of VRC01 before they stopped antiretroviral therapy. Additional infusions were given at two and four weeks after halting antiretroviral therapy and then monthly for up to six months. In a second trial, researchers at the University of Pennsylvania and the University of Alabama gave patients VRC01 infusions one week before stopping antiretroviral therapy and then every three weeks for up to three doses. The results of the studies were published online Nov. 9 in the New England Journal of Medicine. One HIV expert welcomed the results. "These are very early trials so they're mostly trying to show safety, and they certainly did show that the antibody was safe," said Dr. David Rosenthal, medical director of the Center for Young Adult, Adolescent and Pediatric HIV at Northwell Health in Great Neck, N.Y.
"The effectiveness of the therapy is something we are going to have to see in other trials. That will give us a better idea if it is effective and how often it needs to be given," he said. "It will probably take a cocktail of different antibodies to prevent the virus from returning. "Cure research is continuing to progress," Rosenthal said. "It's not around the corner, but this may give patients some hope. In addition, this approach can help individualize therapy."